The whole of the Heart of Wales Line (Swansea to Shrewsbury) should have been consigned to the history books, along with milk churns, Bernard Cribbins look-alike porters from the Railway Children, and racing pigeons in baskets waiting to be released. But it survived, to become one of Britain’s most scenic rail journeys. The writer sampled it. The train pulls into Sugar Loaf Halt, one of the most eccentrically-named and remote places to which you can buy a ticket. If you are reading this on the 07.17 from Surbiton, or any other everyday railway approximation to a sardine can on wheels, then Sugar Loaf is the rush-hour destination for your fantasies. Nobody to be seen. Nothing stirs in the hills and woods around. For a moment we are in that scene from the Westerns, when the gunslinger arrives in town for the shootout. Then a man alights, but with a backpack and a walking stick instead of a Colt. As the train pulls out, I glance back to the 14th least used station in the UK. The man breaks into the smile of someone who suspects that, for this day at least, he has Sugar Loaf Mountain, one of the most empty and glorious chunks of mid Wales, all to himself. By rights this far-away stop, indeed the whole of the Heart of Wales Line, should have been consigned to the history books, along with milk churns, Bernard Cribbins look-alike porters from the Railway Children, and racing pigeons in baskets waiting to be released. Dr Beeching’s red pen must have hovered long over this glorious 120 miles long epic from Shrewsbury to Swansea, through some of the most majestic landscape in Britain. He summarily axed so many other rural routes in the 1960s. Why not this one? Sentiment, still less tourist potential, did not come into it. The reason was business. The line survived only because it also carried freight. Wales has many selling points. Mountains, song, and an ebbing and flowing rugby prowess among them. Let’s add one more: trains. Wales always had lots of railways, once as vital for moving coal and steel as pipelines are for carrying oil in Saudi Arabia. Today the trains are booming again, but this time they are carrying people. True, they were not exactly pressing customers on, Japanese-style, on my trip. But with every hike in the oil price, that famous reprieve for this line makes more sense. If this is the new Age of the Train, and Wales has been writing the opening chapters. Lines snake up into the valleys. They tentacle down to Tenby and into deepest Pembrokeshire. They branch off to all points. One line skewers horizontally through Mid-Wales, with branches down to Aberystwyth, and north up the coast close to fabulous, zany Portmeirion, where they shot The Prisoner. Yet another probes across North Wales, where little steam trains chug to the top of Snowdonia. I needed a week to do them justice, but only had two days. This was my choice. Shrewsbury was the obvious place to start, a historic jumping off point for forays deep into Wales. The 14.05 Heart of Wales train is a crucial departure, and the station announcer treads carefully and respectfully over its 32 stops. The cosy English Borders towns, Bucknell, Hopton Heath, Church Stretton, gradually gave way to names with thickets of double ffs and multiple lls, Pantyffynnon, Llanwrda, Llangennech, Llangynllo. My coach is appropriately named after the famous Swansea rapscallion Dylan Thomas. There is a fair crowd of ruddy-faced country types aboard, heading home from important farming business. A whistle blows. The driver extracts a honk from the horn like the sound of a distressed sea lion. The old diesel engine gives a roar, and we are off over the River Severn on the Great Way West. Soon the poet Houseman’s pleasant ‘Shropshire Lad’ border country is zipping past. Wenlock Edge climbs up on the left. At Craven Arms we branch off the main line and begin to sashay through the outlying hills of Wales. 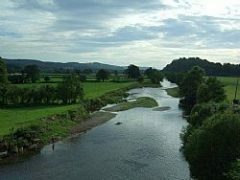 The river at Llandeilo – photo GHD. 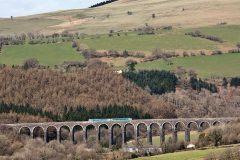 Mid Wales as seen from a train can be simply reduced to about 10,000 picture postcard views. Most of them contain a sumptuous stretches of sparkling streams, bordered by startlingly green meadows, with a little village here, a spectacular viaduct there, all set against waves of hill rolling away into the blue beyond. There’s plenty of time to photograph them all, because we’re moving slower and slower as we head up Wales’s version of the Khyber Pass. But there are no wild tribesmen here (or not any longer) as the line levels out for the spa towns. Delicate Victorians used to ride this line to take the waters in Llanwrtyd Wells, Llangammarch Wells, Llandrindod Wells and the others. I don’t know about the local H2O’s healing record, but I’m sure there is something in the water to confirm Einstein’s theory, that time can be made to run slower. It certainly seems to happen in these seriously-relaxed stations. This train takes almost 4 hours to do 120 miles. Eurostars speed from London to Paris in half the time. But who’s hurrying? I get off at Llandeilo. As an overnight stop, it’s spot on for my low carbon traveling plans. But first the tour. A 25 minute circuit takes in as many wow factor features as you’d find in some A list destinations I know. One ancient castle, Wales’ oldest single spn river bridge, some recently discovered Roman remains, a church rebuilt by Sir Gilbert Scott, lots of smart specialist shops, a rich sprinkling of fine 19th-century houses and the statutory glorious view down over the river Teifi. The National Botanic Garden is Wales is close by. Next day, over my organic breakfast, all sourced from Wales, I considered my transfer options to the station. It is hardly worth starting the engine of a hybrid car. Olympic sprinters could reach the station in half a minute. I give it three minutes, just to be safe. If you have really keen hearing, you could stand on my B&B steps and listened for the train trundling down from Sugar Loaf while I enjoyed an extra piece of toast. I’m back on the train, clattering downhill through the flat green fields of Carmarthenshire. Some Welsh-speakers get on at Amanford and spot a kingfisher. For the less keen-eyed among us, a heron rises unmistakably off the widening estuary. Once this line skirted the sea front at Swansea, past St Helen’s cricket ground where Garfield Sobers was the first person to strike six sixes in an over. Dr B did manage to close that bit: today we enter the city by the non-scenic, more northerly route. I have time to buy some Welsh cakes from the market, and catch a quick drink in the old No Sign Wine Bar in Wind Street – one of Dylan’s old haunts. The writer travelled with help from Arriva Trains Wales, Virgin Trains and First Great Western. My trip on the Cascades train between Portland, Oregon and Seattle.